New Large Showroom just built in store. Get down and check the best stocked flooring company in Greenock. 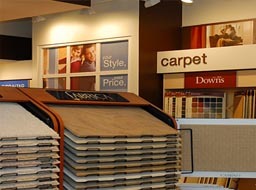 Carpet & Flooring World was established on January the 1st 2004 by Mark Caira . Mark had previously been working locally in the carpet trade since 1991 and gained a vast knowledge of products within the market place . During that time he has taken on board many suggestions made by customers as to pricing , products & services . 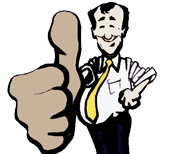 Mark's policy is to always give the best possible advice and service with a smile! Carpet & Flooring World offers Carpets, Cushion Floors, Luxury Vinyl Tiles , Laminates and Rugs to both the domestic and commercial markets. 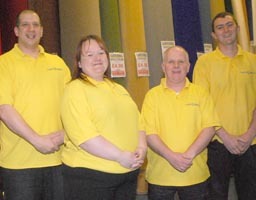 We also offer a carpet uplift service , a free measuring service and a free delivery service. As part of our expansion programme, we have opened a further showroom right next door which has doubled the size of the shop. So come in and have a look around our brand new showroom for the best deals in the town. "OUR AIM IS TO GIVE YOU A BETTER PRODUCT CHEAPER AND FASTER THAN ANY OF OUR COMPETITORS WE BUY IN BULK DIRECT FROM ALL THE TOP MANUFACTURERS AND CAN PROMISE YOU WON'T FIND THE SAME PRODUCT CHEAPER ANYWHERE"
" VISIT THE REST, THEN VISIT THE BEST! " 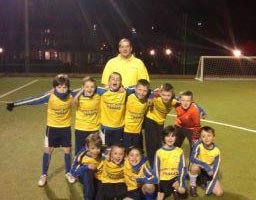 We love to give back something to the community and we are the proud sponsors of Saint Andrews FC. We are dedicated to youth development and we supply new football strips, club track suits and all the training equipment the young people need to fulfil their needs and have fun. We also are working closely with Ramon Salom the head coach and like to help him out when we can. Carpet & Flooring World believes in Community Development and we believe our shop and staff contribute to the community in more ways then one. Want a free measurement ? "We only offer the finest ranges in carpets and all our floorings. We are so confident in our quality that every carpet comes with a guarantee"